A few years back, my son had a fire truck themed birthday party. It was a total blast, and one of the best parts of the whole party was a DIY Backyard Fireman Obstacle Training Course that I set up. I’ve gotten a lot of questions about the details of how I made that obstacle course, so I thought I’d share all the tips and tricks I learned when making an obstacle course for kids! Setting up a backyard obstacle course for kids is really fun and quite easy! The best past is that it doesn’t have to be perfect, and if you can’t find all the materials I used, then you can innovate and use things you have lying around your house instead. Either way, the kids will love it! To start the course, I made a firefighter training course sign that I framed and placed near the first obstacle. Depending upon your theme, you can change up the wording as you like. Noodle Crawl and Cone Run: Our course started out with an army crawl under pool noodles. To make the arches, I used pool noodles and secured them in an arch shape using tent stakes in the ground! After the kids crawled through the noodles, I set up small cones for them to run around in a zig-zag pattern. 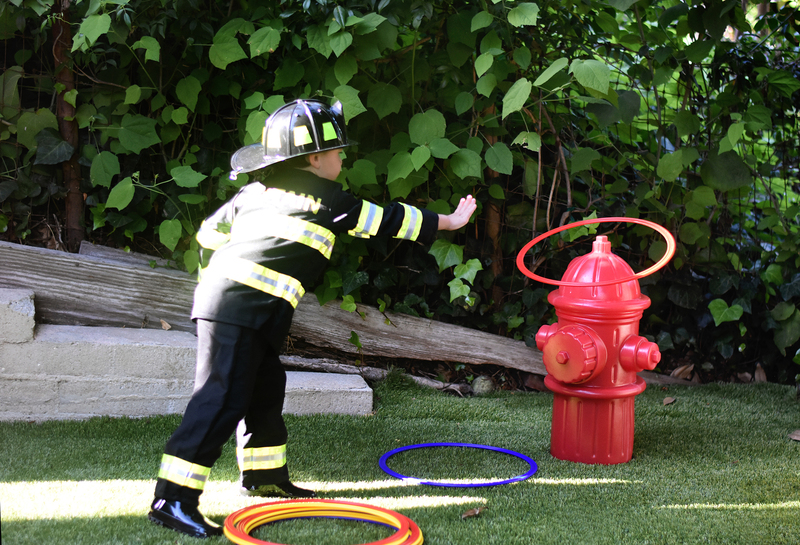 Of course, for our theme, having the kids wear an official firefighter uniform added an extra layer of fun! Fire in the Grocery Store: This was a super fun obstacle that the kids really enjoyed. I used a play grocery store that we already had in our playroom (here’s a similar one). I used red plastic cups and cut flame shapes out of orange and yellow sticky back vinyl and stuck them onto the red plastic cups. Warning—don’t use regular stickers to do this because the kids will be spraying water at the cups to “put out the fire” and regular printer ink will bleed. For the kids to “put out the fire” I purchased a water fire hose backpack, which the kids could pump and spray the flames in the grocery store. This was a HUGE hit! All the kids loved doing this station! They could easily pump and aim the fire hose themselves like a real firefighter! Once they knocked down all the cups, they moved onto the next obstacle. Burning Building Bean Bag Toss: I handmade this burning building, and it did take a chunk of time, but it was so cute when it was all said and done. First, I went to FedEx Office and purchased the biggest shipping box they had. I unfolded it, and hot glued the sides so it would stand up and look like a building. Next, I cut holes for windows in it, and then used self-adhesive brick-print contact paper to cover the building and make it look like it was a real brick building. Make sure to make your windows large enough for a child to throw a bean bag through. I also added flames above each window and a string of some crepe paper flames along the top of our burning building to make it look super realistic! Ring Around the Fire Hydrant: I purchased small hula hoop/training rings and a life-sized plastic fire hydrant. The top of the fire hydrant opens and I filled the base with rocks so that it wouldn’t tip over so easily. Rescuing a Kitty in a Tree: This was the last stop on our obstacle course. We used a real ladder (obviously held and stabilized by an adult), and the kids had fun climbing up the fire ladder to make a rescue! Please someone help get kitty down from that tree! Firefighter Maverick is here to save the day! Maverick used the megaphone at the end of the obstacle course to let everyone know he completed his task and kitty was saved! I hope this post makes setting up a backyard birthday party obstacle course easier for you! To see more details check out the whole firefighter themed birthday party ideas post.